For information about Declaring a Minor, click here. Effective Spring 2012, UNCW has adopted a policy to suspend curriculum changes, such as declarations of major, during key advising points in the semester. The minimum requirement to declare most majors at UNCW is to have earned and passed 24 semester hours with at least a 2.0 GPA. Some majors have additional admissions requirements, such as prerequisite courses and departmental applications. Consult your catalogue and your academic advisor. In general, most students declare a major at the end of their freshman year or at the beginning of their sophomore year. Log onto MySeaport and click on the Academics Tab at the top of the screen. Select the "Major Declaration/Curricular Updates" link, located under the Student Services menu on the right-side of the screen. Click on "Understanding Majors and Degrees" if you have questions. Make selections in the drop down menus. Click add minor/cluster if known. * Make selection from drop-down menu. If undecided click "add-cluster-undecided" button. Undergraduate students must declare and be accepted into a major field of study before or during the semester that they complete 45 hours of credit. Students will not be allowed to pre-register or register for the following semester until a major or a pre-major has been declared. Additional advising may be required prior to registration for continuing students who have completed 30 hours or more and have not declared a major or a pre-major. 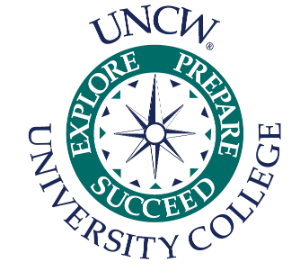 Transfer students are required to select a major or a pre-major at the time of admission to UNCW. Advising for these students is done within the chosen major field. Schools, departments, and programs with admission requirements have a pre-major and that academic unit provides discipline-specific advice. Students accepted into pre-major status should have a high probability of completing the admission requirements in the major within two semesters of acceptance.